Part of the beauty of Gothic aesthetic is the intricate fantasy of embracing the dark as well as the light. Gothic culture gives us the freedom to dream in all shades. What kind of beautiful dreams do you bring to life in your life? 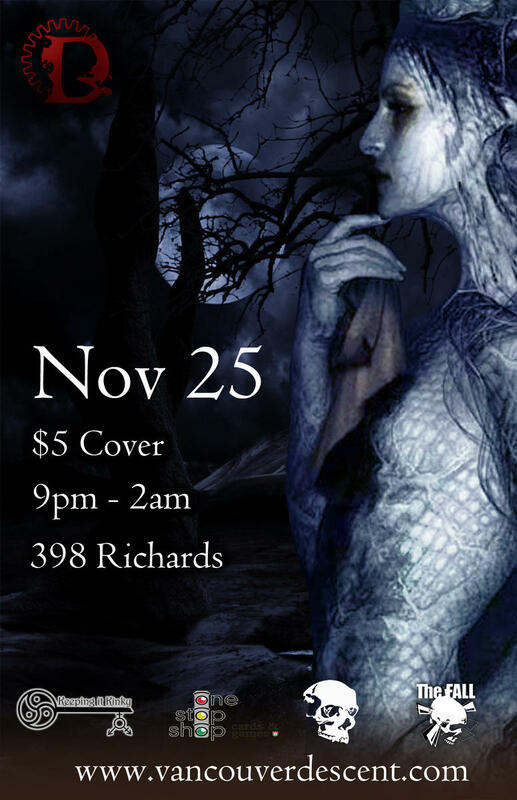 Join us on November 25th to celebrate all the Gothic dreams that make up your passion for alternative culture. Vancouver Descent boasts an exclusively nonexistent dress code. “Why?” you ask. Well, it’s simple: We want everyone who comes to our events to be comfortable. New people entering the scene, or just checking it out, may not have figured out their style. So you may be wondering what is acceptable. Jeans and a t-shirt? No problem. Full out Goth? Totally AWESOME. Punk kid? Rock god? Sk8tr girl? Great! Sweet! Wicked! Feel like going all out in some jaw-dropping ensemble? You’re totally welcome to. Come how you want to but we are strongly encouraging everyone to dress up in their favourite Gothic style. Show us what kind of Gothic dreams you have. Come out and celebrate this night with us because it definitely won’t be the same without you! If there’s a particular song you’d love to hear, you can contact us with your requests early or post them in our Facebook event. Requests can always be made the night of the event as well! So don’t make excuses, don’t stay home. Say to HELL with Mondays and Make the Descent!